Hinsdale Central senior Lauren Fuller has always been a standout in her class for obvious reasons. Lauren, who got her stature from her 6-foot-7 father Scott, has literally taken her volleyball game to new heights—since first trying the sport as a Clarendon Hills Middle School eighth-grader a year after moving to the area from Pasadena, California. She has landed a scholarship to play at the University of San Diego, the preseason 14th-ranked team in NCAA Division I that finished 26-4 and reached the Sweet 16 last season. She picked the Toreros over Long Beach State after only looking at California colleges. Volleyball didn’t necessarily come easily for Lauren, even with her height advantage. She switched to the sport after focusing on basketball for nine years, while she also competed in soccer, swimming, and softball. Her game improved after her middle school coach suggested that she play club volleyball. She earned a spot on the highly regarded Sports Performance club in Aurora. Sports Performance’s year-round training program featured three-hour practice sessions followed by a one-hour weight and conditioning session three times per week that required Lauren to focus solely on her new sport. After her first season there, Lauren made the switch from a middle hitter to an outside hitter. Lauren credits Sports Performance coach Erik Vogt for not only “coaching me to get a scholarship, but in other aspects of life,” especially putting the team first. “He molded me to push myself to be the best student, person and athlete that I can be,” she says. Lauren also calls former Hinsdale Central teammate and school all-time kills leader Ally Davis, now a 6-1 outside hitter at the University of Michigan, her role model. Now Lauren is hoping that she can be a role model and leader for Hinsdale Central in its quest to make this a special season. 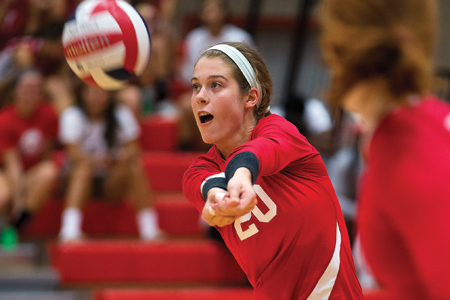 She helped make an immediate impact by earning all-tournament honors for the runner-up Red Devils at the Benet Tournament and receiving Player of the Week honors from the American Volleyball Coaches Association and MaxPreps last month.